Frankincense oil is collected through steam distillation from gum or resin of various varieties of the Boswellia trees, native to Somalia, Pakistan, and India. Frankincense oil is referred to as the King of Oils because of its precious property components that are prized for its extraordinary health and wellness benefits. Ancient Egyptians, Babylonians, and Assyrians used Frankincense for aromatherapy, as salves for skin care, and for beauty rejuvenation. Frankincense oil is beneficial for enhancing mental and physical immunity, reducing stress, promoting emotional peace and relaxation, improving oral hygiene, reducing scars, improving skin tone and firmness, strengthening hair follicles, relieving stomach aches and indigestion, soothing coughs, colds, and flus, encourages healthy cell regeneration, and reducing nasal passage congestion. 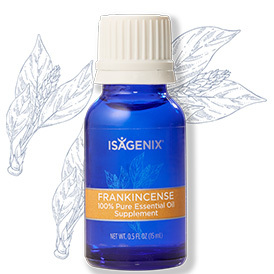 Isagenix Frankincense Essential Oil is safe and effective for aromatic, topical, and internal applications. Isagenix Frankincense Essential Oil has been used for centuries as an anti-inflammatory, anti-anxiety, and immune boosting aid. It is renowned for its abilities to help individuals with its therapeutic, aromatic, anti-aging, and healing properties. Topical use of Isagenix Frankincense Essential Oil helps to reduce acne breakouts, slow the signs of wrinkles and fine lines, reduce sagging skin on abdomen, under eye bags, neck, and chest, decrease scars, stretch marks, and surgical wounds, reduce coughs, flus, respiratory and nasal congestion, and relieve inflammation and discomfort associated with joint pain, arthritis, and digestive problems. Aromatic use of Isagenix Frankincense Essential Oil helps to infuse the air with a relaxing and mood enhancing environment, works as an anti-stress reliever, and boosts mental and physical immune systems. Internal use of Isagenix Frankincense Essential Oil aids personal oral hygiene, helps to relieve constipation, stomach aches, cramps, and gastrointestinal discomfort. Topical Uses: (a) Undiluted – 1-3 drops of oil in the washing machine, on a cotton swab for placement around the home, or in bath water for a relaxing soak; (b) Diluted – mix one drop of oil with 10-12 drops of the carrier Isagenix Essence Coconut Application Oil prior to applying to the desired area. Aromatic Uses: (a) Put 8-10 drops of oil in the Isagenix Essence Aromatic Cool Mist Diffuser and place in the desired area for renewed air freshness; (b) Inhale directly from bottle to open nasal passages, control coughs and colds, relieve chest congestion, and ease sinus congestion. PRECAUTIONS: Prior to the first application of Isagenix Frankincense Essential Oil, test for possible skin sensitivity by applying oil to a small patch of skin. Keep out of reach of pets, small children, and infants. If taking medications, if pregnant, or if nursing, always consult with your primary medical professional prior to any health care changes. Avoid eye contact with any pure strength essential oil. How Do I Buy the Isagenix Oil Frankincense? RECOMMENDED: Sign up and Save (CA$73.99 Signup) — Sign up to the Isagenix autoship program to become eligible to have access to the cheapest wholesale prices. At the end of the checkout process you’ll be asked to set up your next month’s order. Autoship can be cancelled at any time, even after you take advantage of the cheaper prices on your first order! There are no locked in contracts of any sort. Plus, this gives you the opportunity to participate in the Isagenix business (this is 100% optional). Full Retail (CA$98.65) — If you prefer not to sign up and take advantage of the lower pricing, you can purchase the products at full retail price. This is not recommended as you can cancel autoship at any time. If you buy just one of the new oils, I highly recommend Frankincense. I feel 10x better after using it and I can't imagine a day now where I don't! !